There is hardly an area of France in which vines are not cultivated. 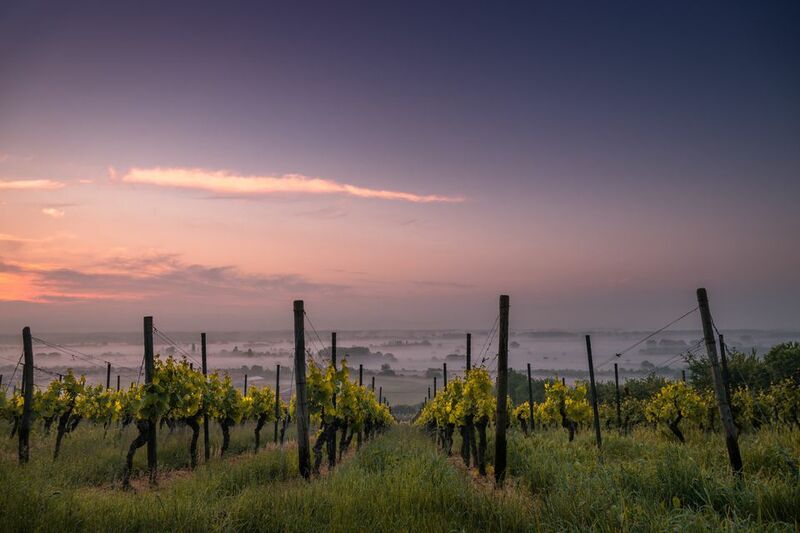 Why not take a tour of some of the most famous vineyards? We'll start off with a discussion of the main wine regions, and then head off to the great vineyards of Burgundy, as good a place as any to start. If you have tipped a glass of wine in the last decade—or at least watched an old black and white movie featuring rich folks—you're likely to have heard the names of at least three of France's great wine regions: Burgundy, Champagne, and Bordeaux. Burgundy: Many of the vines here have been cultivated by monks since at least the 500s. The names of the religious orders became the names of some of France's most renowned wines: Chambertin, Santenay, Pommard, Meursault. You'll be surprised how small the great vineyards are if you decide to walk around them. Each property is made up of a many of small, disconnected parcels of land. 3,500 properties are responsible for two-thirds of the 24,000 hectares of vines planted. You can visit Burgundy by train. We suggest staying in Beaune for the small town experience, or Dijon, if you prefer a larger town. Champagne: Less then 200 km northeast of Paris (a long day trip) starts the Champagne region. Think Veuve Clicquot, Moët et Chandon, Ruinart, Krug, Pommery, Dom Pérignon. Originally the wines of this region weren't sparkling wines. Dom Pérignon started it all by realizing that it was carbon dioxide that made the bubbles and he could make good use of it by bottling the wine before it had fully fermented. Bordeaux: The most extensive wine-producing region of France. Think Petrus, Yquem, Cheval-Blanc, Mouton Rothschild, Château-Margaux, Haut-Brion. Mostly reds made up of a blend of red grapes. But there's also the sweet sauternes of Yquem that go surprisingly well with foie gras. Alsace: Mostly white wines produced near picturesque villages in France's northeast boundary. Twelve different varieties of grape are grown in Alsace: gewürztraminer, riesling, pinot gris (or tokay; the common current name is tokay-pinot gris), small-fruited white and pink muscat, muscat ottonel, pinot blanc, white auxerrois, pinot noir, white sylvaner, white and pink chasselas, klevener d'Heiligenstein (or pink savagnin), and chardonnay. Loire: A diverse region in which you'll find my favorite version of Savignon Blanc: Sancerre. And there are reds as well, try a Chinon. The Rhone Valley: home to many of France's lesser known but noble wines, including my favorite white Tournon sur Rhone as well as the whites and reds from the Cotes du Rhone. Cognac Country: Romans began wine production in Cognac, but in the 16th century it all changed when they started distilling it to more easily transport it on ships. The Dutch called it "brandewijn" for "burnt wine" and with a second distillation and some barrel aging, Cognac was born. April or May is good, as is harvest time from mid to late September—there are usually harvest festivals around this time. Look for signs that say "degustation" for tasting. "En vente directe" means they have direct sales and "vin a' emporter" means they sell wine for you to take with you. Many villages in the wine country have tasting rooms within the village, sometimes representing more than one winery. There may or may not be a small charge for tasting in these places, but remember that a charge may alleviate the ominous hard sell tactics used by some organizations and wineries. You'll need a car (or at least a bicycle) to get to most of the wineries. Tours of the facility or meetings with the winemaker are more of a problem--you may need to contact the winery with credentials to speak to the winemaker or get a tour. Although most wine tours are fairly expensive, they offer several advantages: You will get access to wineries and winemakers that you might not without credentials, you will get translations of talks and tasting notes, you won't have to drive around looking for tasting signs (or drive around at all). On the other hand, if you're just looking to integrate a little wine tasting into your overall vacation, a detour to a wine region can be a great pleasure and will greatly increase your chances of seeing breathtaking views along with stately villages where people have taken pleasure in great wine and food for centuries. There is an advantage of dealing with a commodity which is always in great demand!